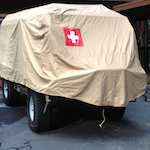 Pinzgauer parts for sale - THE PORTAL HUB - Pinzgauers, Haflingers, Volvo 303s and more! I have some Pinzgauer 710/712 parts that I would like to sell. Most of the parts are new (NOS). The parts are located in Austria, but I can send them anywhere needed. For the price or further information please send me a message. I have also some other parts that I would like to sell, didn’t have time so far to make pictures…. Last edited by niki111 on Fri Jan 19, 2018 10:53 am, edited 1 time in total. Price on exhaust heat exchanger? Brady 712k wrote: Price on exhaust heat exchanger? … 1000USD with free shipment to the US. Just did a deal with Niko on a Pinz cooling Fan and mounting hardware. delivered by USPS here Stateside. Price for the parts was very fair. Do you have a warning light cluster? I am not sure, could you please send me a part number in a PM. Do you still have heat exchanger still up for sale? Front seat bottom and back.